On a SM58, unscrew the windscreen. Look at the capsule on the top of the microphone. 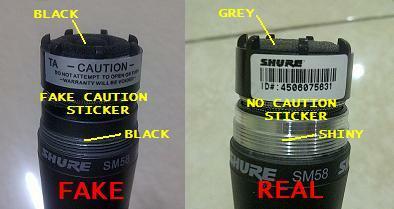 On fake SM58, you’ll find a “CAUTION” sticker wrapped around the capsule head. This is not on authentic microphones. The foamy bit on top of the fake mic is black, on the real one it is grey. The part where you screw on the windscreen should be shiny silver, not dull black in colour. On both the SM58 and SM57, carefully unscrew the microphone in the middle. You’ll see the inside of the microphone, with two wires leading between the sections. On the genuine microphones, these are yellow and green colored, and on many fakes, they’ve followed this color scheme; however, if they’re a different color (eg. black and red), chances are you’re looking at a fake. 3. Contour or No Contour? Look at the round metal piece that connects the windscreen to the body of the mic. On a fake SM58, the round metal piece is smooth without any contour, on a real mic there is a very visible contour. Unzip the Shure mic bag that comes in the package. On the real one, there will be a “MADE IN CHINA'” tag, on the fake one , there is no tag. 5. Shure Sticker and Cable Tie? Check your package, the fake mics usually comes with fake warranty and manuals, but they are most likely missing the Shure Sticker and Cable Tie. So there you have it! The 5 steps to spotting a fake Shure SM58! But if you are not satisfied..
Unscrew the microphone in the middle. Now, look at the circuit board on the lower half. Genuine microphones will have a quality control stamp in red lettering. These will be omitted on the counterfeit mics. The fake microphone will weigh noticeably less than the authentic mic. The box and instructions are of a lower print quality, you can tell they are a photo copy of the originals, the colour isn’t as rich and the print is slightly blurred. The band round the middle of the grill/windscreen is wider, the fake band is 5mm whereas the genuine ones is 4mm. When the grill is removed, the foamy bit on the top of the fake mic is black, on the real one it is grey. 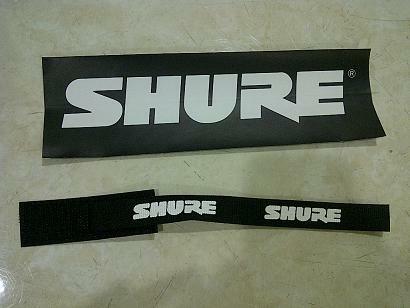 On the real microphone bag, the embossed SHURE logo is visible from inside the bag. A fake SM58 will sound very bright and harsh with moderate gain applied. A genuine 58 will sound like, well, a 58 — smooth in the lows and midrange, with a slightly recessed and pleasant high end. A genuine 57 will give lush midrange tone with great low end response — a counterfeit will not produce similar results.